Walking into the proscenium theater at the Guthrie last night was impressive. On the stage is a very lifelike Brooklyn apartment, complete with a view of Manhattan through the huge windows, with gently falling snow. I could live in this beautiful apartment, with it's brick walls and exposed beams, just a short train ride away from my favorite city. Just gawking at that set provides entertainment, but fortunately the drama that goes on within it is equally captivating. 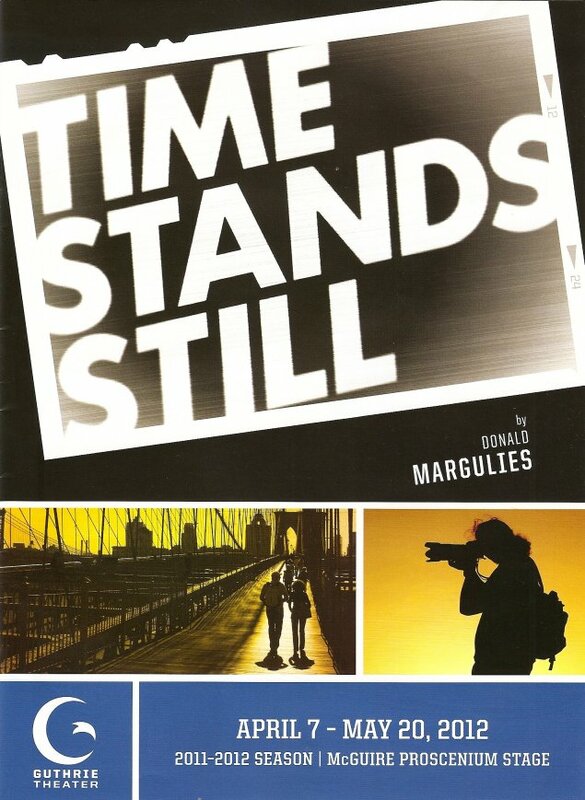 Time Stands Still, written by Donald Margulies, was nominated for a Tony for best play a few years ago. 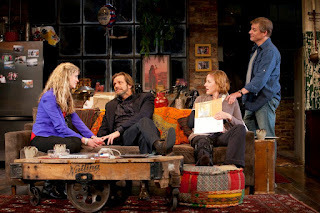 (Incidentally, two of the four plays nominated this year will be produced by the Guthrie next season, Clybourne Park and Other Desert Cities, they know how to pick 'em!) The story centers on a couple who are journalists that travel to war-torn countries to report on the tragedies they see - James through words, and Sarah through photographs. They're forced to re-evaluate their lives, both as individuals and as a couple, when he suffers a mental breakdown and she is almost killed in a roadside bomb. The result is an entertaining, complex, at times joyful, at times devastating, all-around engrossing look at the lives of four friends living in a complicated world. In addition to this complex and interesting couple, the story also involves their good friend and editor Richard (Mark Benninghofen) and his pretty young girlfriend Mandy (Valeri Mudek), who turns out to be much more than a mid-life crisis. James, Sarah, and Richard are jaded and world-weary because of the things they've seen in their work, but Mandy is naive and optimistic, choosing to focus on the joy in life, while the others are surrounded by pain. She can't understand how James and Sarah can simply observe and report on the crises they see without helping. But Sarah explains that she doesn't have the luxury of feeling, her job is to bear witness and show the world what's happening. 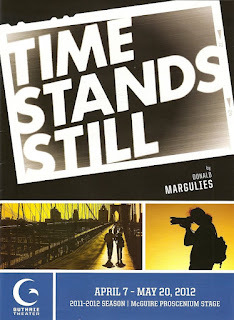 Time Stands Still is a fascinating look at the lives of war journalists, what they experience and what they sacrifice in order to bring truth to the world. But it's also a very intimate story about four friends navigating life in this complicated world we live in, and figuring out how to live with each other while remaining true to who they are. There's not much action, just people sitting around a fabulous Brooklyn apartment talking. I'd watch that any day, provided the words are this well-written and well-acted.